Wrought iron furniture is known for its sturdiness and durability. The furniture tends to age well when kept outdoors. Unlike plastic or wood, it doesn’t deteriorate from moisture caused by humidity or frost, nor does it fade and become brittle when left out in the sun. Wrought iron furniture stands up well in outdoor conditions, but it’s not completely failsafe. Cleaning wrought iron outdoor furniture is a must to ensure it looks its best and to prevent spots of rust forming which can diminish the look of the furniture. How often you clean your wrought iron furniture depends on where you store or keep it. The slightly course nature of the metal can hold extra dust and dirt that can lead to rust. Regular cleaning is important to preserve the look of your furniture and keep it looking its best. If your wrought iron furniture is left unsheltered in the elements, you may consider cleaning the furniture every month or so, to prevent rust spots from forming. A general clean or a deep clean can be beneficial for the furniture. Of course, if your outdoor furniture is kept on a patio or secluded in a space where it does have shelter, you may not need to clean it as often. A general inspection of the furniture every month or so will help you decide on whether the furniture needs to be cleaned. If your time is limited, a general clean can take away some of the dust and dirt that can settle on your wrought iron outdoor furniture. A general clean involves a clean rag and a mix of water and mild detergent soap. Dip the rag into the soap mixture and wipe over the surface. Use another dry, clean rag or towel to dry the excess water. Or alternatively place your furniture out into the sun until dry. A general clean is important every couple of months to really remove ingrained dust and dirt. This prevents rust forming in the crevices of the furniture. Not all rust can be prevented on wrought iron furniture, but monthly inspections of your furniture can identify potential rust spots. A general clean is more involved than a quick spot clean. You will need to take the furniture to a space that you’re happy to get wet and you don’t mind getting a little dirty. The area should be clear and empty, making it easy to clean once you’re finished. 1. Fill two buckets with warm water. Spray bottles can be used instead of buckets. A spray may be able to reach hard crevices. The reason for the two buckets is because one will be needed to hold the cleaning mixture and the other bucket will be used to rinse. Warm water works best. A hose can also be used to rinse. Consider the design of your furniture and what will be the easiest tools to access corners or details. 2. In the first bucket of warm water, add soap. The soap can be a dish detergent or a simple household cleaner. Make sure the cleaner doesn’t contain bleach or anti-bacterial chemicals as this can react with the wrought iron. One tablespoon of dish detergent to one litre of water is the perfect cleaning ratio. 3. Soak a clean rag or sponge into the cleaning solution and scrub your wrought iron furniture. Be sure to scrub each crevice, nook and cranny as they are the areas that tend to house more dust and dirt. Use a circular motion to scrub your furniture. If you use a spray bottle, spray the mixture over the furniture and use the sponge to scrub away the dust and grime. 4. Once your furniture is covered in warm, soapy water, use a hose or rinsing bucket to rinse the furniture. A hose may be quicker if your furniture is quite ornate. The hose can be sprayed into areas that are difficult to reach with a rinsing sponge. If your bucket of rinsing water turns black, empty it and refill with clean water. A bucket of water may use less water than a hose, but the hose may get the furniture rinsed faster. 5. Once your furniture has been rinsed, set it out in the sun to dry. Alternatively, you can use a dry towel or rag to remove excess drips. If the furniture is a bit worse for wear because a general cleaning routine hasn’t been maintained, an intense clean may be needed to get the furniture looking as good as the day it was bought. Sandpaper can be used to lightly sand the furniture to remove any ingrained dirt and rust patches that can’t be removed with a general clean alone. Follow the steps involved in a general clean, but use sandpaper or a wire brush to remove rust spots. If your furniture has stubborn rust spots, use phosphoric acid. Phosphoric acid converts rust, turning it into iron phosphate which looks like a hard, black crust. The phosphoric acid must be applied with protective personal safety gear, including gloves, glasses and mask. It will need to be left on the furniture for a day so the chemical reaction can occur. Phosphoric acid can be bought as a spray or gel. Use whichever will be easiest to apply to the rust spot on your furniture. A spray may be better for hard to reach crevices. Once the conversion has taken place, a wire brush or sandpaper can be used to lightly remove the iron phosphate. If your wrought iron furniture has been painted, a touch-up paint can be used to paint over the furniture to bring it back to its former glory. To prevent your wrought iron furniture from rust and embedded dust and dirt, consider using plastic covers when the furniture is not in use. While this may not appeal to the outdoor look of your garden, it will protect your furniture to ensure it lasts for many decades. Another way to protect your outdoor wrought iron furniture is by applying furniture or car wax. Only apply this to clean and dry wrought iron furniture. The wax will protect your furniture from weather and wear, without the need for plastic covers. If you do choose to coat your furniture with wax, choose a day that is sunny and warm. You don’t want rain to fall on your wrought iron furniture before the wax can dry. A feather duster can be used to remove general dust from your furniture as well. A dust down each week can prevent dust and dirt accumulating on your furniture. 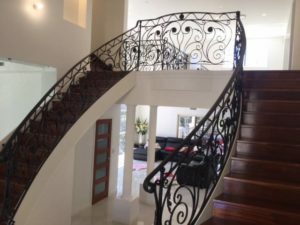 If you’re considering wrought iron furniture for your outdoor area, why not contact Dean Wilson Iron for some design inspiration. The team can offer advice on cleaning wrought iron outdoor furniture to prolong its wear. Browse our gallery for examples of beautiful outdoor furniture we have created for our Brisbane customers or contact us today on 07 3814 0076 with your design ideas. Need help or advice on cleaning wrought iron outdoor furniture? The iron experts at Dean Wilson Iron are here to help. Contact us today on (07) 3814 0076.